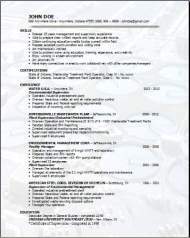 The examples from this page should let you create your waste management resume very quickly. So to help you as much as we can creating your resume, backspacing and entering your own information is really all anyone needs to do. 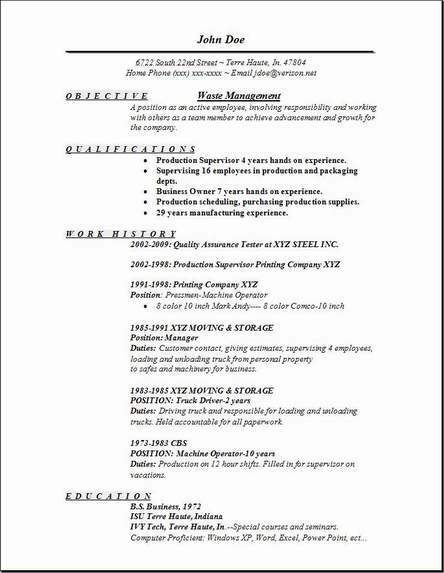 Your new resume should be fast for you to create in somewhere around half an hour a great time saver for our visitors using our word examples. The Water Treatment operator is responsible for control and operation of the Water Treatment Plant to provide an acceptable water quality supply for use in the process systems throughout the production facility. You are also responsible for treatment of waste fluids returned to the Water Treatment Plant to meet compliance standards for discharge into the sewer and or removal from plant site by disposal vendors. This individual must be very detail oriented in the operation and monitoring of water treatment equipment and operations. 4. Basic knowledge of water softeners and conditioning equipment operation. 5. Basic knowledge of wastewater processing methods. 8. Completion of any and all required safety, production and quality documents. 9. Operation of associated water treatment processes and equipment. 10. Monitoring treatment and operating condition of the plant boilers. 11. Verification of water condition and quality. To become a wastewater treatment operator the requirements are a high school diploma or equivalent. Employers often prefer applicants that have obtained a certificate or possibly an associate’s degree from a similar related field such as environmental science, that way it will reduce some of the training a new worker would need. You can find programs like these at community colleges, or technical schools. Water and wastewater treatment plant operators must also attain a license from the state in which they work. No worry though, as the employer after you have finished the in house training and they see your good work ethic, will pay for your license and the training to get it completed.